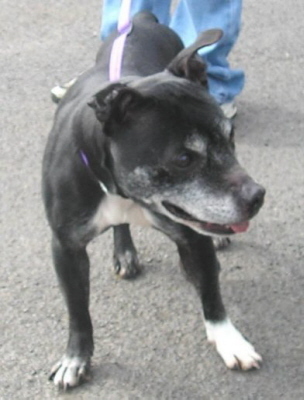 Stella is a mature Staffordshire Bull Terrier female of around 7-8 years of age. She arrived at the pound in need of surgery to remove some lumps, and is now recuperating in foster care while a new home is sought. Stella is currently living with 5 other dogs and has proved to be fine with them, so a companion dog would be possible in her new home if introductions went well. 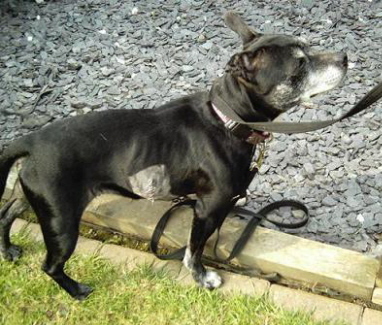 The lumps that were removed are not thought to be anything serious and Stella is in all respects a fit and healthy girl, who has more energy than you would expect from her age. 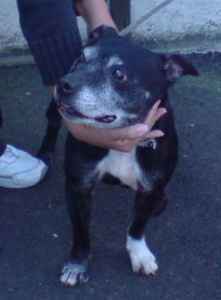 Stella loves people, and adores being fussed and cuddled. 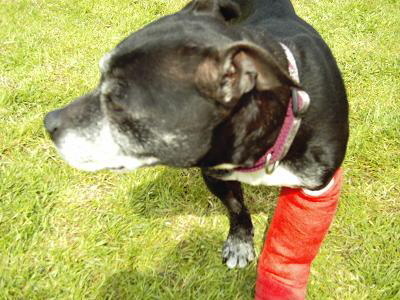 She likes to be walked, and can't wait to be fully fit to run around again. She is quite active but also very laid back, and enthusiastic about life, and would suit an active mature couple or older family situation. She is already proving to enjoy a game with a ball, and has had some evident training as she is very obedient. In her foster home Stella is sleeping in a crate at night, but would prefer to sleep on the bed with you, so we think this is something she is used to. She actually likes to be covered up too! Out walking she is quite strong on lead, and due to her wound cannot wear a harness at the moment, but this would help in the future to make walking easier. Her foster carer is working with this to teach her to walk more comfortably. Stella is not currently living with cats, and we cannot assess how she would react with them, so we are looking for a home without cats. On meeting children Stella has initially been a little shy, but soon comes round and enjoys the extra attention. We would be looking for homes with children aged 5+yrs. Anyone interested in homing Stella needs to contact us or telephone Coryn on 07939 489363 (evenings and weekend) for an informal chat.